This article was first reprinted in Mugwumps, Vol. 4, No. 2, 1975. It was taken from an early 1920s Gibson advertising piece which was lent to us by Herb Trotman, Birmingham, AL. MIH. Tone color is determined by the number, identity, and proportion of the overtones or partials present in the tone of an instrument. In a string instrument these overtones or partials are primarily produced by the string vibrating in sections which are contained within the total ellipse of the vibrating string, each section decreasing in length in the ratio of whole numbers and vibrating faster in the same ratio. This will be better understood after the reader has studied the table below which gives the overtones possible to a G mandolin string. It is not possible in the limited space available to discuss the above table at length, although such comment and explanation would be very interesting. In brief, however, we may say that in every musical tone some of these overtones, up to the 30th are present in varying proportions. Each series of overtones effects the tone in a different way. That series which is the same pitch as the fundamental (although in different octaves - and shown in our table as the first, third, seventh, and fifteenth) adds brilliancy to the tone but not richness nor mellowness. The next series, a fifth from the fundamental (shown as the second, fifth and eleventh) also adds to the brilliancy but in addition contributes to the richness of the tone. The next series, beginning with the fourth overtone, adds more richness and almost no brilliancy. The further away the overtone is from perfect consonance with the fundamental, the more richness and less brilliancy the overtone adds. When a mandolinist or violinist plays natural harmonics, he places his finger at the nodal point of that overtone having the same pitch as the harmonic he wants, and the nodal point is found by computing the number of sections in which the string is to vibrate. Now refer to our table: For the first overtone, touch the string one-half the distance from the nut to the bridge. For the second, one-third the distance. For the third, one-fourth the distance, etc. It is evident that natural harmonics furnish a way to measure the number and proportion of overtones present, for when the player touches the strings at one of the nodal points he stops vibrations of all sections of the string vibrating at a lower rate of speed than the particular overtone produced at that point, leaving that overtone as the lowest pitch in the resulting tone and consequently making the resulting harmonic that pitch. The overtones above the lowest one left are still sounding, however, and may be eliminated one by one until nothing is left. When the string is stopped completely by the finger - that is, pressed clear to the finger- board - the quality of tone is different from the same pitched harmonic because the fingered note has its own fundamental, and sets up a series of overtones of its own while the harmonic has only what is left of the series belonging to that open string. 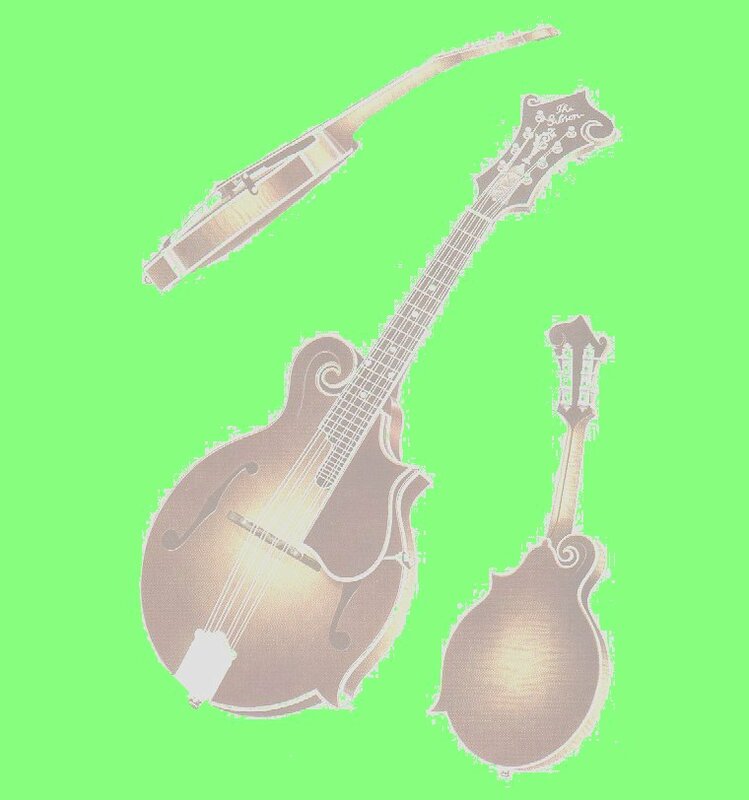 The tones of many non-Gibson mandolins have been analyzed in this way and invariably the overtones have been scanty in number, lacking in power and mostly of the series making the tone brilliant but thin, nasal or colorless. The first five or six only are present and the fundamental is usually too great a percent of the total tone, with the result that the tone is dull and hollow, or thin and colorless. With the Gibson Master Mandolin it is possible to isolate and identify the first twelve overtones on the G string; the 2nd, 4th, 5th, 6th, 8th, 9th and 10th are decidedly present and all of these enrich and beautify the tone. The 1st, 3rd, 7th, etc. are also there but this series is usually present so is not here emphasized. So, in commenting on the beautiful tone color obtained from the Master Mandolin we have something more to go on than individual opinion, for the overtones produced compare favorably in number and proportion with those of the violin, trumpet, clarinet, French horn and any of the other orchestral instruments noted for their rich full tones.